If I had to write an abbreviated review of this story I could do it in just 3 words: TAS, FAN, and TIC (thought not necessarily in that order). More savvy readers will want an elaborated review consisting of something between 5 and 10 words, but if I'm going to put that much effort into it, why stop there? I have a very high opinion of this story, despite the fact that author Chance Maree continues a trend of leaving out a critical story element essential to a reading experience through which the reader can guess at the entire arc of a story simply by reading the first paragraph: the electric trombonist. I'll do my best to avoid sounding like I'm pandering, but if I happen to slip into a state of clear adulation, don't blame me, blame the author. Maree's narrative has achieved that sought-after balance, giving just enough information without giving too much. The dialogue and plotting is crisp and taut as a bowstring. Maree does not overwrite, or show off, though she is clearly capable of the latter if she chooses, and that kind of restraint tends to make the best stories. If I had to make a comparison, both in tone and sharpness, it would probably be Joe Haldeman's The Forever War. In both, humanity as a collective is an abrasive and destructive species. In Maree's story, people have exhausted their own world and intend to populate others as hurriedly and perhaps recklessly as possible, resulting in conflict between settlers and natives; in Haldeman's they've come across an alien species they naturally deem hostile when they retaliate after being attacked. Some of Maree's characters have a very strong sense of Manifest Destiny, which is all the more enjoyable when things don't go exactly as planned. Apart from the greased-lightning pace of the work, Maree begins very early on teasing with a few curious mysteries: a murder, a shared hallucination, a worldwide evacuation, a boy with mysterious powers, and a planet seemingly occupied by, of all things for a group of people searching for a new land to encounter, Native Americans. All of which give additional giddyup to the story. To say these are the only mysteries, however, would be a great disservice. Like all futuristic sci-fi works, a story has to make some bold projections that can be cynical or optimistic, but ultimately realistic if the work is to remain compelling and believable. If it isn't believable, it's no longer science fiction, it's fantasy, and it may as well have elves and magic, and therefore may as well have a THIS SPELL WINS EVERYTHING conclusion because there's really no boundaries to prevent it from happening. 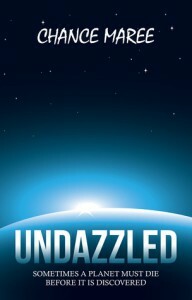 Happily, Undazzled manages its cynicism, optimism, and prognostications very well, raising eyebrows but never creating a moment where the reader thinks: "Oh, well that would never happen in the real world." Considering the sci-fi aspect of this work, it was also pleasant to see the characters behaving sensibly, motivated by genuine human concerns, and a plot structured around these concerns (or vice versa) in convincing fashion. Not all sci-fi tales are fortunate enough to have Maree as their author. Perhaps the most hard-to-swallow aspect is the idea of a giant worm-like creature that actually eats tunnels in the space-time continuum, creating wormholes--it is essentially a pun come to life. Of course, the Functional Worm is by now a staple in the sci-fi/fantasy canon. Stated as such in a vacuum, that probably seems, at the least, improbable. But details are so well-chosen, the description of the process so visceral and tangible, that it seems entirely possible. After all, technology, while becoming more complex, becomes so as a consequence of finding simpler ways to do complicated tasks. Once, computers filled entire rooms because we needed fist-sized transistors to create on-off values (e.g., 0 or 1) to represent "data" or "no data". One transistor amounted to one "bit". When we realized we could make transistors by passing electrons through silicon, we could fit hundreds, thousands, millions of on-off switches on a chip the size of a fingertip. So it may go with space travel. A colossal quantity of energy might be required to pinch two points of space time together in order to shorten the trip, but what if there was a creature that did so naturally? Perhaps the strongest component of the story is a subtle undercurrent of profundity. There is a wealth of allusion to digest and dissect in an effort to reach the full meaning of the story. Encampments are named after physicists, astronomers, etc. ; the hallucinations are very specific and curiously restricted; the parallels to European colonization of the Americas is hard to miss. Just to name a few. It's possible there is no added meaning to these things, but such is the strength of so many other aspects of the story that you just have to wonder whether or not every piece of the tale is not some carefully chosen note, selected for the specific purpose of filling an important slot in the stave of a fascinating and mind-stretching symphony. Ultimately, in less deft hands, this tale could have been a mess. Instead, it was well balanced, swift, compelling, and made the machinery of my head pump and smoke as it searched for meaning in every allusion. It's a book that I not only enjoyed and recommend, but one I might spend my limited reading lifetime reading again.